[Blackwing Productions] Heroes of Terra Kickstarter Coming in February! 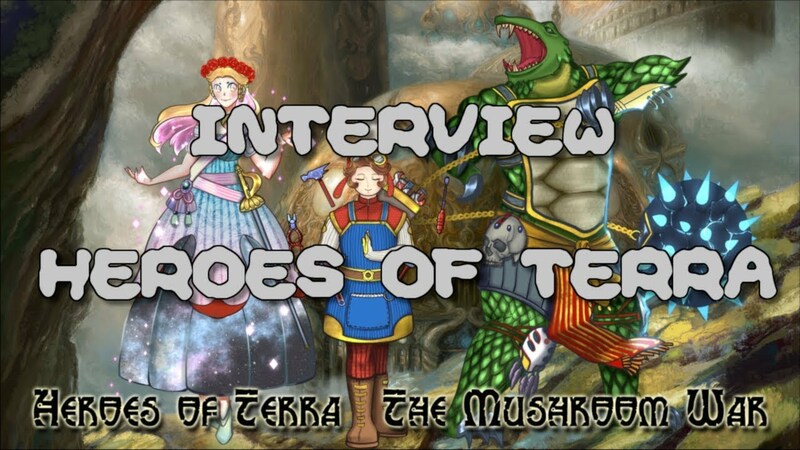 Now that SWADE is out to the public, it's a good time to announce that the Kickstarter for Heroes of Terra: The Mushroom War will be coming to Kickstarter on Wednesday, February 13! Keep an eye out for it! For those unfamiliar with our Heroes of Terra campaign setting, it can best be summed up as a world of floral sorcery and saurian savagery in the vein of John Carter of Mars meets Super Mario Brothers. The players take on roles as champions of the conquered Mandragoran Kingdom in its fight against the bloodthirsty kappa of the Dragon Empire in a world where humans are rare and mythical heroes! The humanoid plant people of Lemuria and the turtle-like kappa have been at one another's throats for generations, but five years ago, a slathering horde of fungal berserkers poured out of the wilderness at the behest of the kappa's Dragon Emperor. The king of the peaceful mandragoran people was slain, and his daughter, the Peachblossom Princess, is thought to be held captive in one of the kingdom's eight great fortress-cities. A resistance against the kappa has grown, including former Mandrake Guardsmen, their quetzal mount-partners, monastic Acorn Warriors, and even renegade magitechnicians from the Dragon Empire's ranks. This fragile coalition is held together by a handful of human heroes, the only folk respected by all of the factions. Join the Peachblossom Resistance and restore peace to the kingdom! The Heroes of Terra Jumpstart will be coming to SWADE backers in the next month or so, in plenty of time for people to decide if they want to join the KS campaign. If you can't wait that long, the Heroes of Terra Rough Cut Player's Guide is available on DTRPG for only $5! We hope you'll support this Kickstarter to bring the Heroes of Terra setting to full-color life, including a Plot Point campaign, "Our Princess is in Another Castle"! Hopefully Nintendo won't come down on you like a ton of bricks. Heh. If they haven't so far, they're not going to. And my work is definitely in the "loving homage" category rather than the "direct satire" category. Either way, I'm writing well within the limits of protected parody and derivative work. You're probably right. Still, though I'm not sure how it would work internationally, Japanese copyright law has a reputation for being far less forgiving of parodies than American copyright law. We're at the halfway mark of the Kickstarter, so if you haven't checked it out yet, you should! Some great info in that interview. I really hope the PPC gets funded. With less than a day to go, we're funded! Woohoo!